A smartphone is a necessary evil. Mostly each and every single person carries a smartphone in the pocket. Some blame smartphone as a source of time wastage, but there are some people who know the value of smartphone and us it in an efficient way. For engineers, it can be a lifesaver when it comes to its computing power and mobility. Here are 10 apps that every engineer should have in his or her smartphone. This is the fabulous app covers all the major fields of engineering such as chemical, civil, mechanical, electrical, environmental and hydrology. 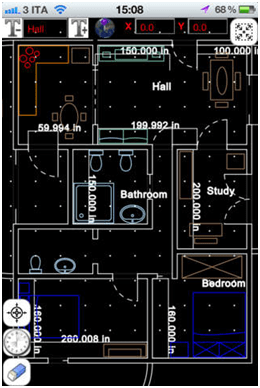 It includes 650 formulas from all the combined fields and an additional 100 conversion formulas along with a section for area formulas, this app is the best all-rounder. The app costs $11.99. A blessing for Civil and Architect Engineers. 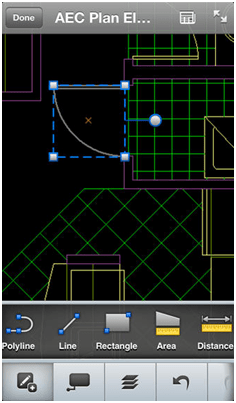 This free app lets engineers view, edit and share DWG format drawings. This provides a portable and convenient method for managing DWG, DWF and DSXF files at any location, even on the site. Files sent as email attachments can also be viewed and edited with this app. A must have for designing engineers. A computer-aided design (CAD) app for technical drawing purposes. Engineers can draw anything using FingerCAD that they could draw using the PC counterparts, including houses, mechanical components, bridges, geometrical figures and many more. The app costs $5.99. Find it difficult to remember units?? This app can be used by engineers, scientists and students. 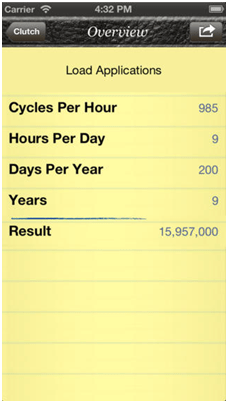 A must have for anyone related to the field of engineering, this unit conversion app offers dimensions used by engineers on a daily basis. Simple to use, this unit converter can even handle negative values for temperature and pressure. The cost of this app is only $1.99. This app made exclusively for mechanical engineers contains 300 mechanical engineering formulas, 300 additional conversion formulas and 70 area formulas. 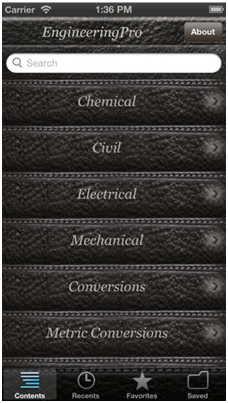 The app has sections including fluid power, heat transfer, internal combustion, kinetic energy, power plants, shafts springs, vehicle drive and many more. The cost of the app is $5.99. Find your system calculator useless?? Every engineer needs a trusty calculator. 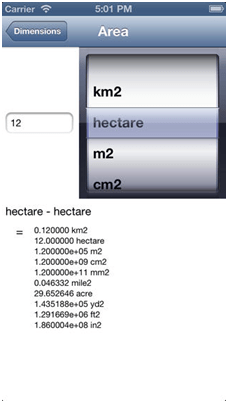 The TouchCalc has a scientific mode, bit/integer mode and a statistics mode to allow engineers to use this one app for a variety of numerical and analytical tasks. 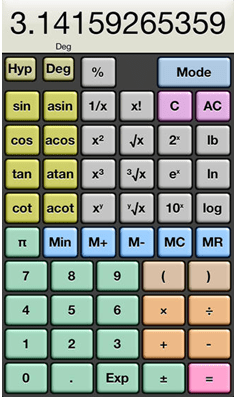 Each mode is able to perform the task that any scientific calculator can perform. The app is available for free. 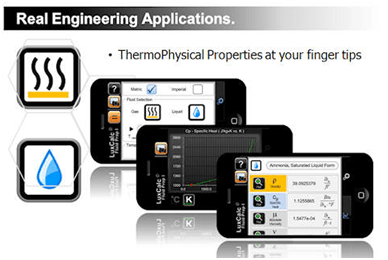 Allows engineers to calculate thermophysical properties of common fluids within an accuracy of 5%. Great for thermal analysis, this app can give you data for any given temperature found in heat transfer books such as specific heat, viscosity (both absolute and dynamic), thermal expansion, etc. The app is small in size and costs only $0.99. 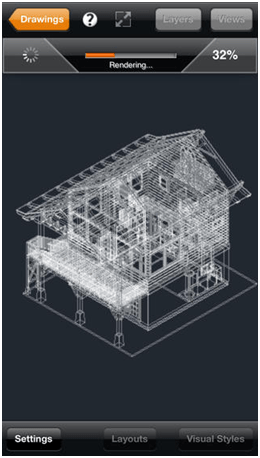 This app allows you to view 2-D and 3-D DWG files and use multi-touch functions that allow you to zoom in, out, pan and rotate the drawings to view them at different angles. The files can be viewed by directly emailing them to your smartphone or iPad. The app costs $6.99. 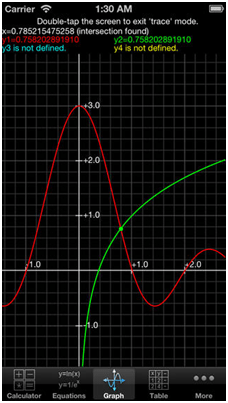 This app allows you to use your iPad as a function plotter and scientific calculator. The app includes a custom keyboard which allows you to type equations more quickly and conveniently and can plot multiple equations on a single graph. 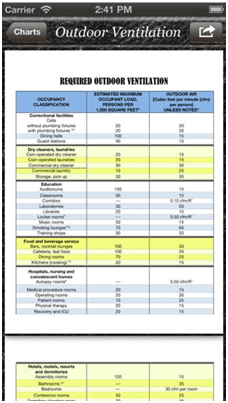 The graph can be viewed in real time and screenshots can be emailed easily. The Graphing Calculator costs $1.99. Thank you for the app recommendations. I am old school and have not embraced fully technology. I kind of enjoy the freedom of being disconnected. ASM may change that. I look forward to using some of these apps. Great Information useful for me as well as everyone. Helpful info. Fortunate me I found your web site by chance, and I’m stunned with it. And Merry Christmas to you!